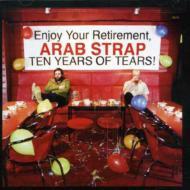 After six studio albums, three live albums and countless gigs, Arab Strap are to split up. A book-end compilation album and a celebratory farewell tour will mark the end of Aidan Moffat and Malcolm Middleton's ten year relationship. Titled TEN YEARS OF TEARS, the compilation is by no means a traditional 'Best Of' collection. Comprising B-Sides, demos, remixes, new recordings, live tracks, and Peel sessions, it's a handpicked selection designed to give a full picture of this unique band.